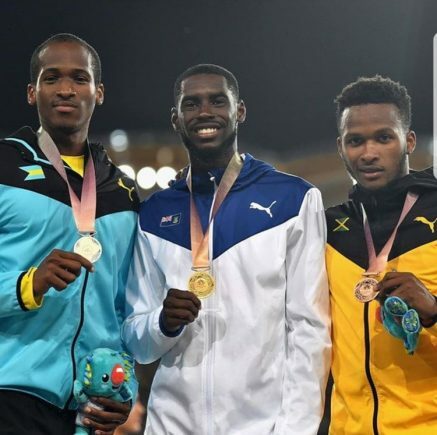 12th April 2018 – Jaheel Hyde (JAM) and Dina Asher Smith (GBR) won bronze medals in the 400m hurdles and 200m respectively at the Commonwealth Games being held on the Gold Coast of Australia. Jaheel showed good strength off the final hurdle to earn his medal in a time 49.16 seconds. After an exceptional junior career that saw him win two world junior titles, this was a first senior medal for Jaheel that he dedicated to his mum. In a high-quality women’s 200m final that contained two reigning Olympic Champions Dina ran an exceptional bend and was in contention as she transitioned into the straight. In the end it came down to a dip for the medal and Dina timed it right as she edged out Elaine Thompson in a time of 22.44 seconds. These were the first medals for PACE athletes at the Championships but there were still some fine performances on the previous days. Thomas Ayeko (UGA) ran an exceptional race in the men’s 5000m final and narrowly missed a medal as he took fourth place in 13:54.78. Bralon Taplin (GRN) negotiated his way through the rounds of the men’s 400m and laid it all out in the final eventually taking fifth in 45.38 seconds. Stephanie Twell (GBR) ran her fastest 1500m for five years and placed seventh in the women’s 1500m clocking 4:05.56. World Championships bronze medallist Ristananna Tracey (JAM) was eighth in the women’s 400m hurdles final.